Charakter - Advisor. Punkte: 9/12. Ausdauer: 9. 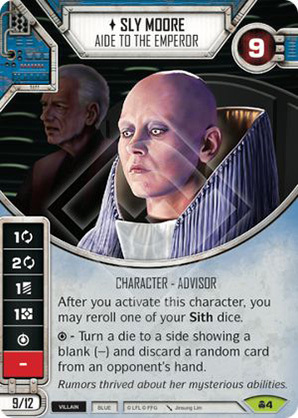 After you activate this character, you may reroll one of your Sith dice. - Turn a die to a side showing a blank () and discard a random card from an opponent's hand. Rumors thrived about her mysterious abilities.